Background: The neutrophil-to-lymphocyte ratio (NLR) has been shown to be associated with a valuable prognostic marker in solid tumors. Non-muscle invasive bladder tumor is an early-stage tumor with high recurrence rates. 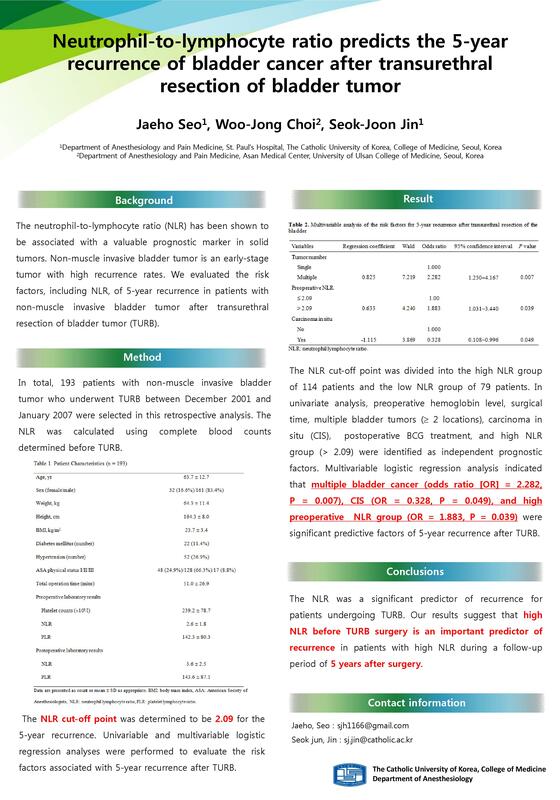 We evaluated the risk factors, including NLR, of 5-year recurrence in patients with non-muscle invasive bladder tumor after transurethral resection of bladder tumor (TURB). Methods: In total, 193 patients with non-muscle invasive bladder tumor who underwent TURB between December 2001 and January 2007 were selected in this retrospective analysis. The NLR was calculated using complete blood counts determined before TURB. The NLR cut‑off point was determined to be 2.09 for the 5-year recurrence. Univariable and multivariable logistic regression analyses were performed to evaluate the risk factors associated with 5-year recurrence after TURB. Results: The NLR cut-off point was divided into the high NLR group of 114 patients and the low NLR group of 79 patients. In univariate analysis, preoperative hemoglobin level, surgical time, multiple bladder tumors (more than 2 locations), carcinoma in situ (CIS), postoperative BCG treatment, and high NLR group (> 2.09) were identified as independent prognostic factors. Multivariable logistic regression analysis indicated that multiple bladder cancer (odds ratio [OR] = 2.282, P = 0.007), CIS (OR = 0.328, P = 0.049), and high preoperative NLR group (OR = 1.883, P = 0.039) were significant predictive factors of 5-year recurrence after TURB. Conclusions: The NLR was a significant predictor of recurrence for patients undergoing TURB. Our results suggest that high NLR before TURB surgery is an important predictor of recurrence in patients with high NLR during a follow-up period of 5 years after surgery.